Have you cited DMAB5567RH in a publication? Let us know and earn a reward for your research. Ring, BZ; Seitz, RS; et al. 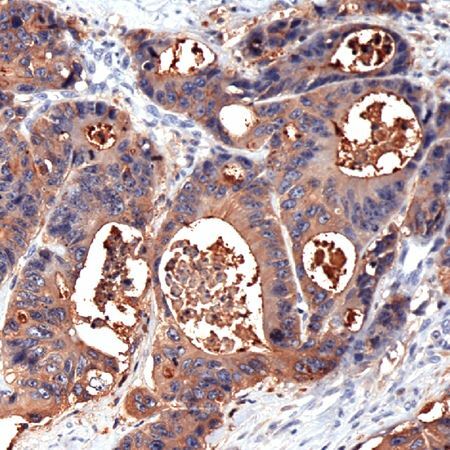 Novel prognostic immunohistochemical biomarker panel for estrogen receptor-positive breast cancer. JOURNAL OF CLINICAL ONCOLOGY 24:3039-3047(2006). Blumenthal, RD; Osorio, L; et al. Carcinoembryonic antigen antibody inhibits lung metastasis and augments chemotherapy in a human colonic carcinoma xenograft. CANCER IMMUNOLOGY IMMUNOTHERAPY 54:315-327(2005).